Working with lighting in Sketchup is tricky; most people export their model to a rendering package and work on materials and shadows. We’ve been playing with staying in Sketchup, using Styles and doing this quickly and more loose. As frequent readers know, I like our renderings to show some “hand” and be more conceptual. This design was originally shown with a darker accent color but the client wanted to see it in all white as well. We left the white glass backsplash for now but perhaps this could use a textured gloss tile instead for a little more pop. The cubes are white oak boxes which will be back lighted with small LED strips. We were tempted to show the exterior street scene through the large glass windows but again, time can get out of hand when working on digital renderings. Also, no need to be distracting here; the client knows what is outside of their windows. This view shows an important table area that design staff uses with visiting clients – through the windows passerby can see some creative work in action, creating some buzz. Whenever possible we try and make the entire space a working design as opposed to a static showplace devoid of life. This is the third renovation for this particular client and we are always happy to work with our old friends in the business. Future projects include some new lighting collections about to hit market, and also more kitchen projects – always kitchens! Knockoff. Webster’s definition reads as “a cheap of inferior copy of something”. A bit similar to “knock down” and “knockout” but to be sure I refer to plagiarized, and again by a big box store with the victim being an Amerock hardware design. The unit’s cup pull is as close to my Amerock Manor pull as one can get, only not as wide. As I have stated before, I don’t mind so much to be knocked off as I can just design another knob or handle very quickly. In this case I’m actually a bit proud to think a 13 year design still holds up enough to be copied so blatantly. My goal of “timeless appeal” seems to have been met. While I will continue using the world’s architectural monuments for inspiration – as any good artist should – some will simply copy other’s designs. I don’t suppose there are great old buildings and fascinating streets to wander out in the Big Box corporate park, but that should not be an excuse for failing to come up with an original design. I was recently walking a “big box store” – nameless for now – and noticed some private label cabinet hardware that carried an uncanny similarity to a design I did for Amerock a few years ago. This doesn’t bother me as this sort of thing happens all time. You know what they say about imitation and flattery. My designs have a subtle curve the ‘Box models lack, but looking at the knob in particular I think we can say my designs have undoubtedly provided the inspiration for these retail pieces. Discussing plagiarism in design is a important topic and a little too deep for me to tackle today. In this case Amerock is not sold in this particular store; the product manager probably wanted to have something similar to my design, but could not find it in their manufacturer’s catalog. In today’s product development environment, it’s simply a matter of sending a drawing (or “inspirational sample”) to your Far East factory and ordering the minimum quantity to have something very close in your store. You are looking at a die cast and chrome plated “actual handle”, and two development prototypes. At some point I changed the design from the awful 3-banded idea to this simple and frankly, “familiar” bow handle design that would have been a typical design in the 1930-50’s. Our product team rejected the design in the end however, and we went ahead with some other products. The die cast mold went on a shelf in China. It may not be the actual mold, but the engineers could have changed it a touch and then passed the product over to this other buyer. I just can’t see how my design would otherwise be so similar. I have nothing against Hafele here at all – it’s been years since I have done this design and I just find it amusing. I wonder how many of my other “rejected” designs may be out there under another company? In other news, I have designed the kitchen area for another store for Pirch, the exciting appliance and fixture retailer – a great location in downtown New York. The opening is later this month; look for a feature on the store in a few weeks time. Like many designers (and also hobbyists), I have been recently enamored to Sketchup. For those unfamiliar, Sketchup is a free* 3D design software associated with Google (but sold off a few years ago to a company called Trimble). I have been using SU to work on environment design (as opposed to product design), as it is very quick to get ideas across and quickly develop views to communicate your design intent. Most will maintain that drawing by hand is an essential function to working out your designs. Many are familiar with the story of a “napkin sketch”, or a squiggly Frank Gehry concept drawing; there will always be a place for quick sketches. With tools like free 3D design packages however, detailed hand drawings are becoming too difficult to justify. 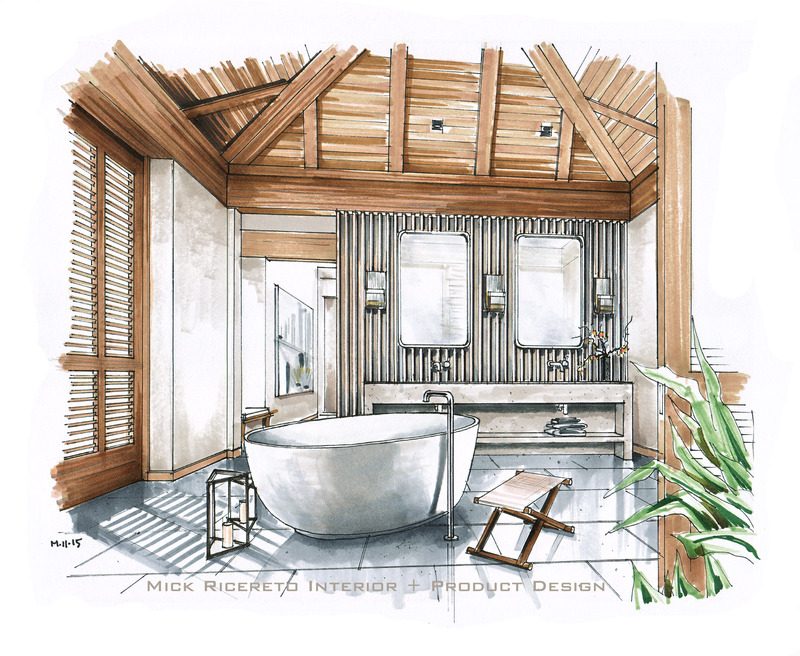 Hand Rendering – Charming but time to move on? Did I say *Free? The basic program is free but a Pro version allows many more features including the full-featured Layout element which is similar to Paper Space in AutoCAD. I use Pro as I would like to master the Layout feature and eventually move away from ACAD. As mentioned before in previous posts, I’m well aware the time-consuming method of drawing by hand is charming but inefficient in today’s design world. Although I can draw quite quickly in a loose fashion (napkin sketches and so on), more and more of my clients are used to seeing photo-realistic renderings and as this becomes the norm pencil and marker sketches just simply will not cut it. It isn’t the speed and the efficiency alone that renders hand drawings obsolete (sorry), but the fact that realism is so easily obtainable and frankly expected in luxury interior presentations. Worst is when you need to present a few options in the same space; this is where digital designing such as SU can manage things in a few clicks. Basic SU Presentation. No Post-SU rendering needed for quick images such as this. Although my screen shots show basic line work, you can always export your SU model to a rendering package (also inexpensive) to get into photo realism. It should be noted there are consultancies – many in Eastern Europe or Asia – who do nothing but make renderings of complex buildings and other important 3D projects. These “Rendering Farms” have super computers toiling away to make your models look like the CGI from Skywalker Ranch. After working in SU for a year or two, it became quite clear that although I don’t need CGI-level rendering yet, the quality of materials representation and purchasable interior elements make a big difference to the quality of your design. Looking at my screen shots above, I’m referring to not only the realism of the stone floor but the appliances, the paintings I placed on the wall (small replications of a friend’s work), the chairs – all the things we called Entourage back in the pens-and-marker days. With hand drawings you draw these elements yourself, or Photoshop things in later. With 3D design, you can insert scale models of products into your room. One of Sketchup’s most powerful features is their database of objects you can download and use in your design; the 3D Warehouse. The 3DW is a user-uploaded repository of free models. If it has been uploaded to the Warehouse, you can use it. Some “power users” display entire buildings and iconic models they constructed in the manner of a gallery. I have seen the Empire State Building, Endeavor Space Shuttle, Tie Fighters … there are some incredible models uploaded to the 3DW. For me and other furniture designers/manufacturers however, the 3DW presents a unique opportunity to get our products in the hands of architects and specifiers. By having your commercially-available designs in the 3DW, there is a very good chance of having your pieces specified when the design gets executed in real life. With this in mind, I have recently been converting my product designs to the SU 3DW format and uploading them for other designers and hobbyists to use. In the first week I had a couple of hundred downloads of some of my lighting designs. Who is looking at/using my product models? This I do not know, as there is not a feedback loop or way to track who is using what. So far the most popular of my products is the above Space Array fixture, at over a hundred downloads by itself. Not bad for the first week. I looked at some iconic furniture pieces by well-known manufacturers and their downloads were in the many thousands. Surely some of these model usages will result in actual sales, right? How many of you, dear readers, are using Sketchup and the 3D Warehouse? Do you use actual products you intend to specify for the final project? Does the availability of a model on the 3DW increase your chance of using it in real life? With dozens of lighting fixtures currently in production – not to mention the scores of Amerock hardware designs I did between 2004 and 2009 – I could put a huge amount of product on the 3DW. I’ll continue to focus on the newer and better designs for now, with the hope of getting a wider audience for my more marketable designs. If you are a Sketchup user please have a visit to my product gallery and try some of my lighting and hardware in your models. I’d love to know how they work in your designs. As the holiday season gets into full swing here in the States, we are wrapping up some private projects, studio designs and renderings for other designers. Everybody likes hand renderings so I will share some of the more interesting rooms we have been working on. First up is a difficult kitchen space for our good friends in California. This is a stunning house, but with an odd shape to the kitchen which took some clever design to get organized. The designers moved some doors and windows around to get a better spatial flow to the room. We didn’t do much here, other than render the design. Cabinets are SieMatic Classic, in Sterling Grey gloss lacquer. Next up is a more eclectic design in a very traditional house in South Carolina. The client wanted something darker and more modern in this – again – difficult-shaped kitchen space. We helped add some character to the room by designing a banquette and treating the existing brick wall with a Silestone wainscoting to tie the kitchen finishes and the architecture together. I could completely see myself sipping coffee by the window on a nice spring morning. This next project was a rendering for a real estate developer in Florida. 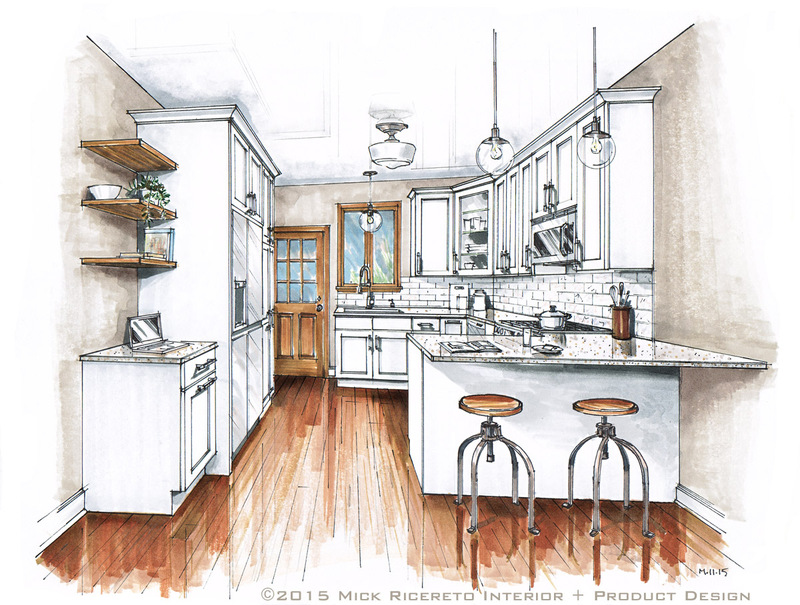 This is a small kitchen, but using the same care we use on our big design projects. Where prospective home buyers would normally expect a basic digital rendering of the space, we like to think this accessorized and inviting view gives a better impression of the builder’s product. 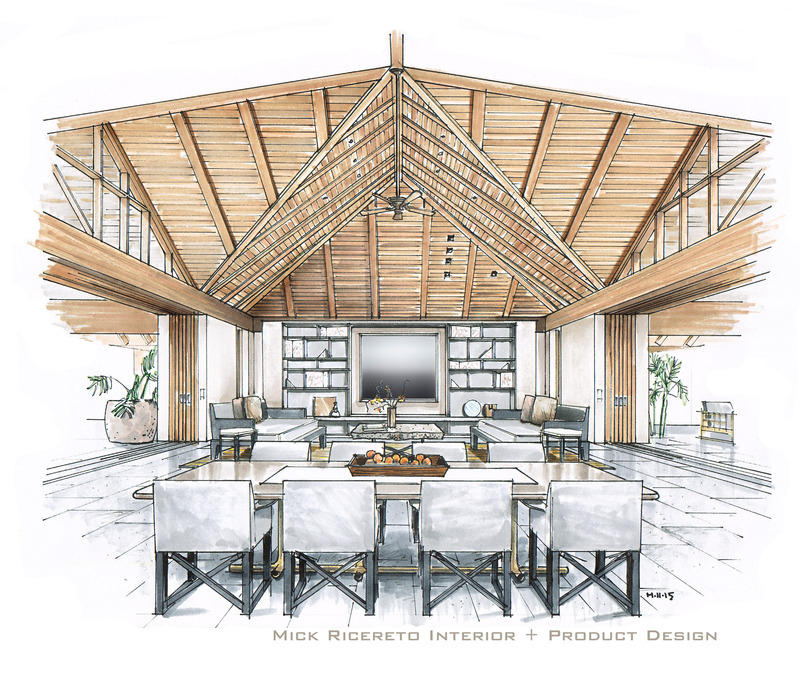 This next project are renderings for a villa in Hawaii. The designers were looking to update the traditional Japanese-style interior to a more minimalist and clean look, while retaining the incredible inside-outside living that is unique to this climate. First is the great room, with a view to the dining table and sitting area. The kitchen is behind the camera in this view. The floor here is slate, which continues inside and out seamlessly. The sliding doors are shown here pocketed; there is almost no divider between the outdoors and in. The next view is the bathroom, which has an open arrangement to allow a great view from the bathtub. The bedroom has a similar set of sliding doors to the outside. The piece on the wall is a Donald Judd-style wall sculpture. 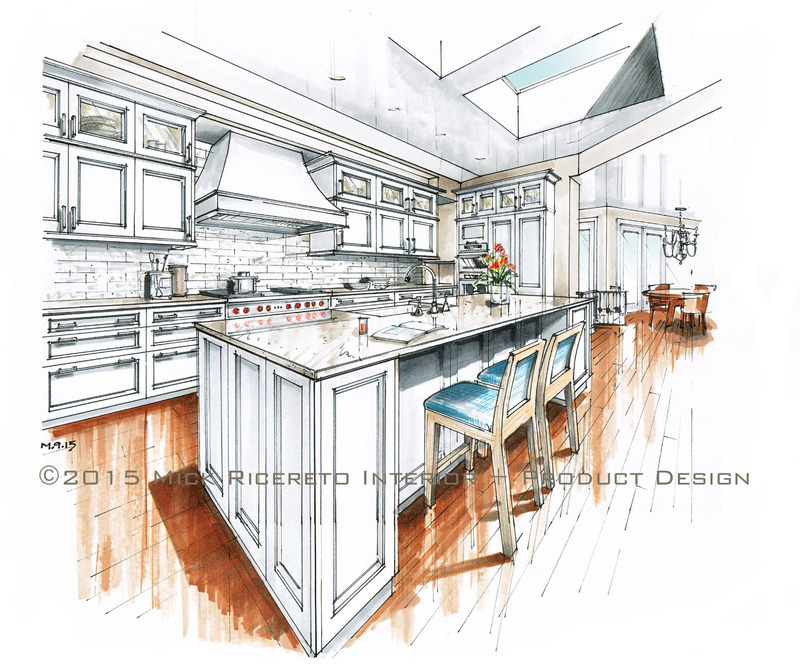 Back to kitchens, here is our third prize winning entry to the Blanco Dream Kitchen contest from this past October. The rules required the fitting of a Blanco sink and faucet (which we use extensively in most of our projects), but otherwise the design and style of one’s entry was completely open for creativity. Our design is a very modern and modest kitchen using grey woods, stainless steel and for the room’s centerpiece, a black Corian custom angled island. Our Ilex Space Array chandelier in black is above the sink/eating area, and this finish ties in to the blackened oak tall cabinets/room divider to the right. I like how our Blanco project resembles the Hawaii resort above. The lifestyle is not dissimilar, although our space is in a North American urban area; the desire to bring the outdoors in is an almost universal request when designing living spaces today. 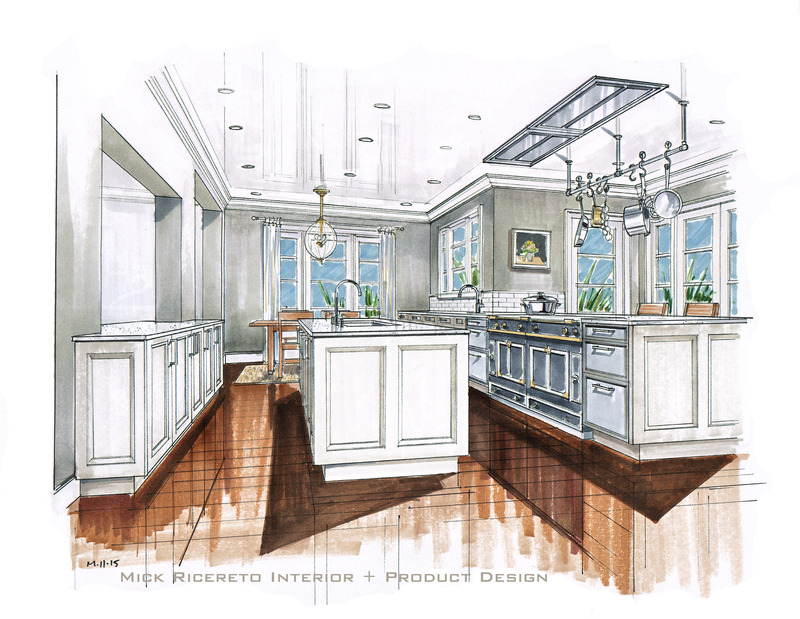 The next project is a rendering for our colleagues in California, a kitchen for an industry executive. We worked carefully on the proportions of these upper cabinets as the ceiling is a bit low and we didn’t want to misrepresent the design by making it appear taller than it actually is. Hand rendering of course should be considered an “artist’s impression”, but that doesn’t mean we should not strive for accuracy in the design. This last project was done earlier in the autumn; a nice big traditional kitchen for our friends again in South Carolina. This is an expertly-tailored space with some very nice door details. Again, another kitchen with a lot of openings and a tricky space to design but I think the room comes together with an exquisite use of vertical proportions and a consistent horizontal datum. 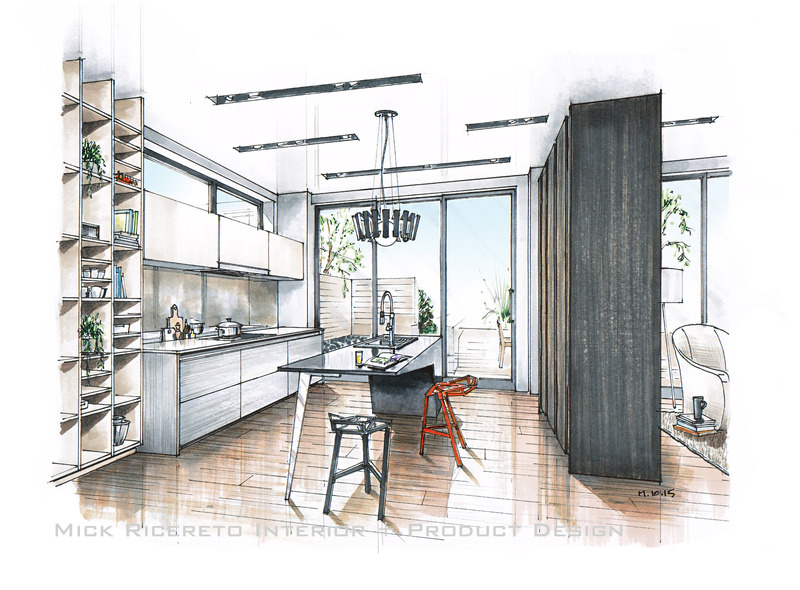 In addition to these residential renderings we have some private kitchens and as usual, kitchen studio projects and other retail spaces on our boards. 2015 has been a busy year here in our new Philadelphia studio. We look forward to some relaxation time this holiday season and continued growth for 2016. 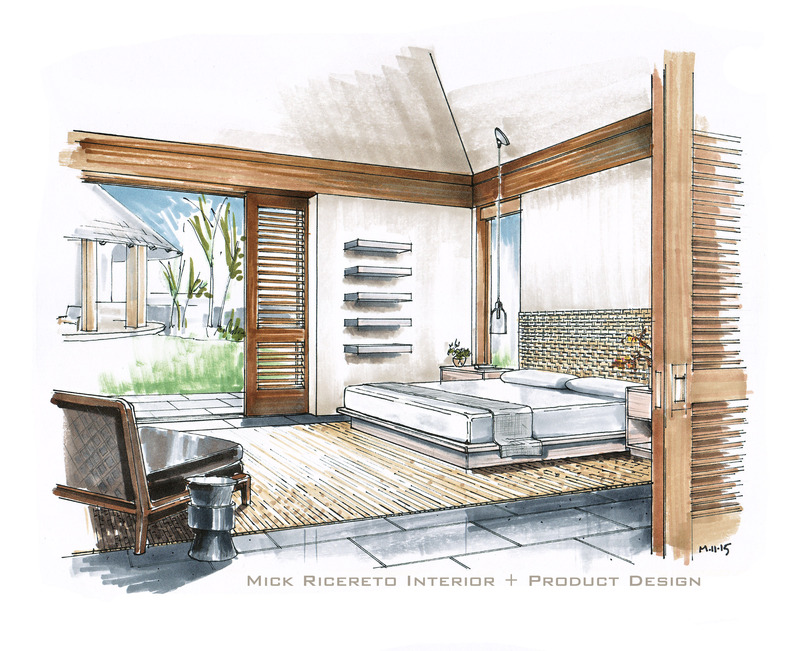 Thanks for visiting the blog and please also see our Facebook page Here for photos, travel impressions and general goings-on at Mick Ricereto Interior + Product Design. 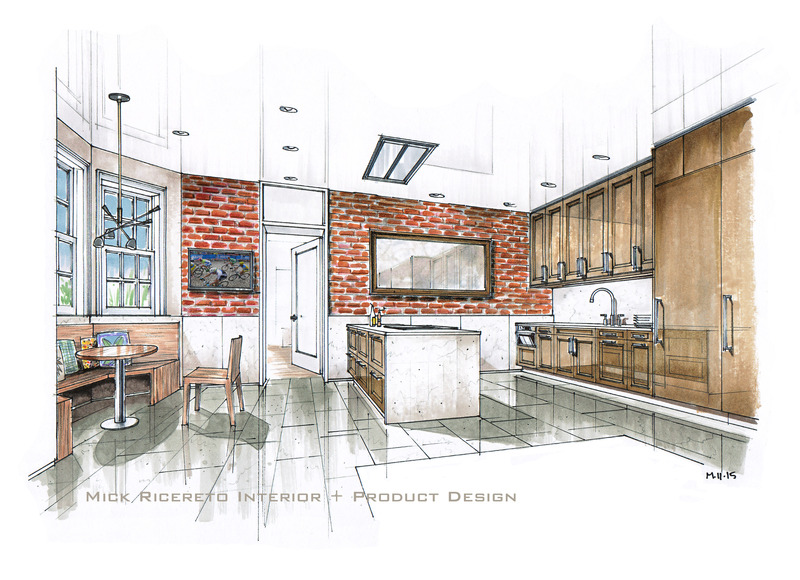 We’ve recently done renderings for other designer’s kitchen projects. Although my first inclination is to work in a more modern context, when helping out colleagues I’m often involved with “classic” designs. 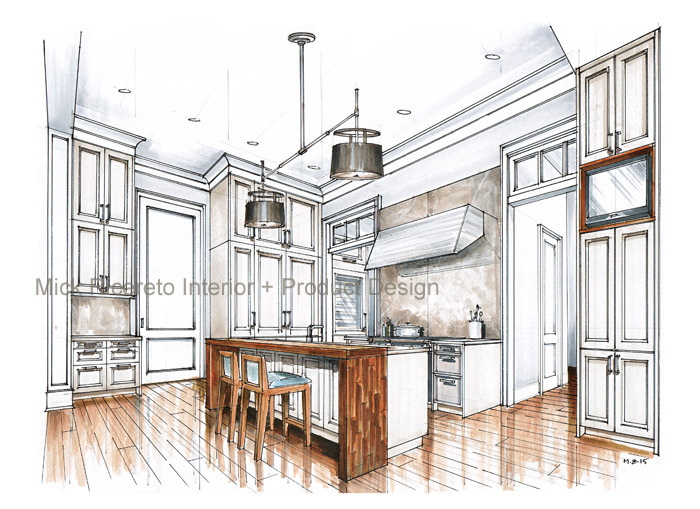 These two SieMatic Beaux Arts kitchens are typical examples of a single-view rendering needed to supplement a high-end kitchen renovation proposal. The client may otherwise only have a plan and elevation to fully understand the design intent; renderings help the project come alive. This first example shows how the designers integrated the cabinets into the architecture of the room. Careful planning of horizontal joints and header heights pull it all together. Spaces like this – kitchen as hub of the house with many ways in and out – can be particularly challenging to work with but they did a great job in tying it all together. This next project came with a low ceiling and existing skylight structure, for which the designers put considerable attention into the upper cabinets to get the right proportions. I needed to carefully draw my base layout to accurately portray the widths and heights of the design elements. Since I draw everything by hand and do everything by eye/feel (no measurements whatsoever), sometimes there are false starts where you get the angle a bit wrong and need to start over. Again I think this design solves the room’s challenges well and the interesting soffit bits keep your eye moving and make this a special room. I’m often asked why I continue to do hand drawings when I could model in Sketchup or others and have unlimited views. Well, I do actually, but hand drawings are fun and you “wright” a design instead of just click it to life. The designer’s organic connection to the paper and the scraping medium which makes the marks (the pencils and pens) provide a feedback which is just different to working on a computer. Another recent project was designed for a competition. I’ll share the rendering here as it is a bit more my preferred flavor of style. This is my design, from a completely white sheet of paper. Lots of care went into finishes, such as stainless steel base cabinets, black matte oak on the tall cabinets/room divider at right, the deeply-combed grey oak floor and the angled black Corian island. The idea was to place an interesting island in an otherwise basic square room to show how just a few new ideas could create a dynamic design. The island has a polished stainless steel leg on only one side. I tested this in scale and with the massive base at the left end, it is remarkably stable. Notice the shadow lines above the shelf at left and black oak wall divider cabinets at right; I do not like taking cabinets to the ceiling and much prefer to use a shadow gap. A gap at the top expands the room visually and is easier to install. We have been busy with some industrial design projects and helping out with the Design Philadelphia festival here in town. I’ll post more hand renderings from time-to-time so thanks for viewing and see also our Facebook page for other recent projects.